"The Congress and its allies have lost their credibility. They have lost people's faith in the country," said Modi while addressing an election rally here. "The Opposition is making false accusations every day and night. They have no vision for carrying the country forward. They have no vision, no mission, no policy and no leader as well. The opposition has only one agenda 'Modi Hatao'," said the Prime Minister. "Congress has hatched a conspiracy for the destruction of our faith and our tradition. The conspiracy was to link the Hindus of the country with terror," he added. "Congress can go to any extent for power. 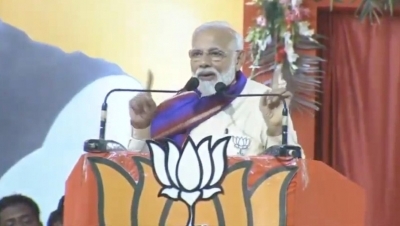 The history of Congress has it that it can divide the country for power, Vande Mataram can be broken into pieces for power and it can split states for power," said Modi. He said the 'Chowkidar' stands as a wall against every conspiracy of Congress. "A person can talk about peace, whose muscles has strength. Who listens to the dead people? We have seen the government talking about peace, the world has not listened to us. When we showed strength, the world is standing with us today," said Modi.